One thing I am really loving about this whole experience is how friends are getting behind it, and either joining me in my challenges, or, as in this instance, completely fixing it for me to have a new experience that I would have no idea how to organise otherwise! 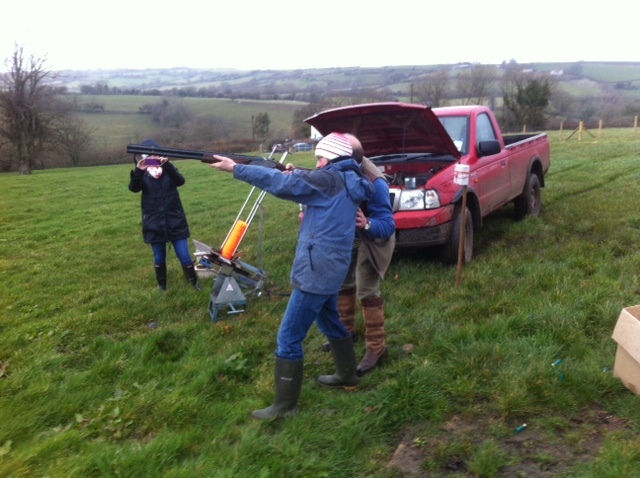 A good friend just happens to have her own large field, and a very amenable farming dad, complete with guns, clay pigeons, machines to fire them with, and sufficient patience and expertise to supervise a shooting session for me and anyone else who cared to join in. So she organised a legendary ‘lunch and shoot’ to take place on her 40th birthday, the day after a large group of friends had been celebrating this happy event with considerable gusto. We gathered outside under ominous skies. Equipment was assembled, clays loaded, and instructions given. Some of the men stepped up and had a go, they hit some, they missed some, but it all looked fairly achievable. Point gun, clay is fired, bang, clay smashes to smithereens, everyone cheers. Marvellous. Then I stepped up. And it all began to look considerably less easy. Firstly the gun was immensely heavy. Second my posture was all wrong. I was leaning too far back and firing up into the trees. Further explanation was offered by the infinitely patient Phil Coombs. I was to look along the length of the gun, and line up the clay with the little red light on the end of it. Well I was already seeing at least 2 guns, whether due to excess booze, or wearing glasses, I wasn’t sure. Then there was the timing issue. It took a few seconds to line up the gun with the clay thing even once I had the gun in focus – by which time of course the clay thing had moved. Dammit. My first 2 bullets shot into the sky. Ditto the next 2. And the next. Oh dear. Feet begin shuffling. I was losing my audience. ‘Do you have to actually hit something?’ people began to ask. ‘Did you put ‘shoot something’, or ‘shoot at something’?’ asked another, hopefully. 2 more bullets evaded the clay. ‘I’m not getting this’ I muttered. ‘No you’re not’ agreed my tutor with some feeling. The audience sniggered. Phil explained the principles again. Foot forward. Weight on front foot. Do not lean back. Do not absent-mindedly brandish the gun in the direction of spectators. Ah yes. I nodded sagely, as if all were now clear. Then I shot again, and to everyone’s hearty astonishment, I hit one! Wahay! I had just been mentally composing a blog post for abject failure, so hurrah and huzzah to actually do it! It was strangely satisfying, even though it was only a clay disc. I had a couple more shots, but it had clearly been a fluke. No further success. But no matter, I hit one, and so challenge number 25 is achieved. A quarter of the way through! This entry was posted in humour, new experience, sport and tagged shooting. Bookmark the permalink. ← #24: Have a drastic haircut!